Marbach has been growing continuously. Since 2016 the number of company employees has increased from 1,300 to 1,500. Today Marbach has 200 employees more than 3 years ago. This increase of more than 15 % illustrates the positive development of the mid-sized family business. The trend continues. Stefanie Schier, Commercial Managing Director at Marbach: "This year we have managed to reach the 1,500 employee mark. This growth is not only due to our German companies, but also to our foreign subsidiaries. In recent years we have extended and accelerated our global reach by opening new subsidiaries in China and Mexico. Over the next few years, we will continue to expand our existing locations and push ahead with the process of internationalization." Marbach was founded in 1923 and has since developed into one of the most important global players in the packaging market. Marbach has different solutions for the blanking process in its portfolio: the compact blanker, marbablanker (photo) and lightblanker. The latter two have quietly become the industry standard in recent years. Automatic blanking is fully in trend. Compared to manual blank separation, it brings increased productivity to the entire postpress sector. In addition, it ensures precise stacking of blanks or paperboard sheets. These advantages mean an existing blanking unit in a machine should be used as often as possible. Even for short runs. This increases the efficiency of the further processing of packaging. It saves the operator time and as a result costs for the packaging manufacturer. In addition, it prevents possible health issues for the machine operators, as the physical work required to separate the blanks by hand becomes obsolete. Sales Manager Bernhard Reisser: "For blanking, we work with a modular system similar to that used in the automotive industry. This means that our solutions are quickly available and we can respond very flexibly to customer expectations. Our systems are all ready-to-use, so that they can be easily and quickly installed in the blanking station. Without long set-up times. We offer a wide range of solutions. Depending on our customer's needs and technical requirements." The lightblanker is a modular blanking tool. Its advantage: the base frame can remain in the machine. It can be quickly and easily adapted to the order-specific separating form for any application. Due to its quick-lock system, it is ready for use in just a few simple steps. Reisser: "Since the introduction of the Marbach lightblanker, our customers have increasingly relied on automatic blanking, even for small runs and simple layouts. In 2014, our customers did this in only 5% of cases, today in more than 30%. In other words, the rate of automatic blanking compared to manual blanking has risen sharply for short runs and simple layouts. And the strong upward trend continues." For frequent repeat orders, Marbach recommends the marbablanker to its customers. The marbablanker is individually tailored to the customer's needs and is distinguished by its low weight and high stability compared to a comparable tool in full steel design. Since the tool frame is individually designed for each order and firmly attached to the actual separating form, the marbablanker ensures short set-up times. Reisser continues: "With our different technologies for the blanking station, we can offer the right solution for every requirement. Providing maximum flexibility for our customers". With its marbanick|2 for paperboard tools, Marbach has brought a hand tool onto the market that convinces users with its flexibility and simplicity. Since its introduction in May 2018, Marbach has sold almost 200 of these hand-held devices. Marketing Manager Tina Dost: "The marbanick|2 is very popular with our customers. It allows them to add waste nicks afterwards in order to optimally adapt the cutting-die to the local conditions. The positioning of the nicks is very quick, safe and controlled." In addition, the marbanick|2 is characterized by its flexibility. It has three levels, so that three different nick thicknesses can be inserted with one device. Conventional systems available on the market are limited to a single nick size. Here different attachments or even three different devices would be necessary. Dost continues: "Our customers, who use the marbanick|2, only need one device with which they can flexibly insert nicks. This saves them time, space and money, and the purchase of the marbanick|2 is very inexpensive compared to the industry alternatives." The marbanick|2 is available in a set with useful accessories such as a special attachment for the die-cutting machine and a second chisel. Marbach recently presented its new embossing register system for embossing-dies under the name PES IV. One customer who has been successfully using this system for several months now is A&R Carton in Kriftel, Germany. The responsible department heads at A&R report: "In the past, we often had problems setting up embossings to the printed image. This process took a very long time. In addition, precise make-ready was very difficult. We spoke with our cutting-die supplier Marbach about the need to reduce make-ready times and yet still achieve optimum fitting accuracy. At Marbach, the development department went to work and developed a solution. Marbach designed a system with which the embossing can be quickly and easily adjusted to the print image. A&R continues: "The PES IV is not only easy to handle, but the set-up is much faster and more accurate than with our conventional method. This saves us a lot of make-ready time and allows us to begin producing our packaging much faster. Our thanks to Marbach for making production easier and increasing productivity." With Marbach's embossing register system IV, the embossings are optimally aligned to the printed image by using special register pins. The focus of Marbach is optimizing the performance of its customers. For this reason Marbach offers extensive services. In addition to training on the subject of die-cutting packaging, Marbach now also offers packaging services in its portfolio. Jan Brunner, Head of Business Development at Marbach: "Packaging must not only convince in terms of appearance, but must also in smooth functionality. Only then will it be successful. This is why we not only strive to offer our customers top tooling solutions, but also additional packaging related services. With our new 360° packaging services, we support our customers right from the start. For optimized packaging functionality." In addition to individual packaging development, through which Marbach's customers receive completely new packaging designs – matching the packaged goods – customers can also order package optimization. Not only that, but Marbach also can create and provide CAD data according to samples as well as producing samples and small series. Brunner continues: "In practice it can happen that a beautiful packaging design is developed, but in spite of experience and expertise cannot be technically implemented. Should this happen, a compromise must be found between design and technical implementation. This costs time. And money. But if we take over the packaging development or optimization from the very beginning, customers will have the great advantage that we can directly check the technical implementation of tools during the development of packaging or the creation of data. This ensures packaging functionality. And time resources are used to best effect." Marbach opened its training center earlier this year. Under the name Marbach Academy, the company now offers practical training courses for participants from the packaging industry. The new training catalogue for 2019 is now available. Marketing Manager Tina Dost: "We are very pleased with the positive feedback from previous course attendees. The great benefits our training courses have had for participants has encouraged us to expand the Academy yet further. Our new training catalog contains some already established training courses as well as new ones. We have implemented trainee suggestions and extended our program." 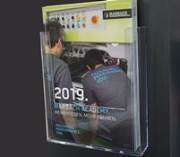 Marbach presented its training catalog for 2019 at FachPack. Visitor interest was high with training registrations being received directly after the trade fair. Marbach expects there to be continued lively interest in training courses next year as well. Dost continues: "The concept of the Marbach Academy has been developed in such a way that participants are ensured the greatest possible benefit. Because the training courses take place in small groups. With a lot of practice. But of course some theory too. The great advantage of small groups: the trainer can respond to the participants individually and can design the training individually as well. For the attendees, this means they can get the greatest possible benefit out of their training." The training catalog 2019 is available at academy@marbach.com or www.marbach.com/360-service. You can also find an overview of the training courses on the company's homepage www.marbach.com/trainings. Marbach's extensive range of services includes not only training but also packaging services. The focus of the Heilbronn-based company is always on customer performance. Because this special technology has many other advantages, it is becoming increasingly popular on the market. Marketing Manager Tina Dost: "Packaging must be beautiful. We have developed pure edge to ensure that the visible edges of corrugated board packaging also have an attractive appearance. With this technology, angel hair on the edges of corrugated board packaging is a thing of the past. The use of pure edge has shown that this technology creates many more important advantages for our customers". The use of pure edge protects the cutting tips of the cutting rules. For customers, this means a significantly longer lifecycle for their cutting-dies as well as better cutting results. In addition, the rule joints are stabilized in narrow places or in circumferential die-cutting so that no unwanted nicks occur. This improves the quality of the packaging. Another application: pure edge can be used as a replacement for the functional rubbering of a cutting-die. Compared to a tool equipped with functional rubbering, it permits die-cutting using relatively low cutting pressure. This protects and ensures a very long lifecycle for the tool. Dost continues: "pure edge not only ensures visually appealing packaging at the point of sale, but also extends the lifecycle of the cutting-die. Thus, our customers benefit in two respects. They have flawless packaging and save costs due to the long life span of their cutting-dies. Marbach customers appreciate these advantages and increasingly use pure edge. There are many rotary machines for die-cutting corrugated board. The machines of the Japanese machine manufacturer Mitsubishi are currently making inroads in Europe. These machines place completely new demands on the tool technology used. Marbach has met the challenge and developed tools specially designed for these machines. For maximum productivity in rotary die-cutting. Mitsubishi machines employ a different technology than conventional rotary machines. They have an integrated self-ejecting system in which waste is stripped using ejector pins. However, this also means that conventional tools are unable to meet the requirements, so special rotary cutting-dies must be used. These tools are complex to manufacture and must be extremely precise. Marbach developer Ingo Graham: "Over the last few months we have developed tools that are perfectly matched to the requirements of these special rotary machines. Customers who have already ordered the corresponding tools from us are very satisfied with them. They benefit from 100 % freedom from waste of their blanks as well as very high running speeds of their rotary machine. Die-cutting, folding and gluing are also carried out in a single operation. The productivity of this machine in combination with Marbach tool technology is therefore very high. For maximum performance in rotary die-cutting." Marbach will continue to monitor market developments and will also in future offer the right solution for every requirement. Marbach opened its training center six months ago with the name Marbach Academy. Under the motto: "More knowledge. More skills. ", Marbach offers practical training for participants from the fields of folding boxes, cigarette and corrugated board packaging. The extensive portfolio also includes individual training courses as well as training for board manufacturers. Since the start of the Marbach Academy, many customers and partners from the packaging sector have been trained at Marbach. Tina Dost, Marketing Manager at Marbach: "After six months we can now draw the first conclusions. Our diverse range of training courses has been very well received by the market. So far, we have welcomed almost 100 participants to our Academy. The feedback has been overwhelmingly positive. The participants were particularly enthusiastic about the competence of the Marbach trainers and the practical relevance of the training courses. But also the fact that the training took place in small groups was rated positively by many. Participants were able to take with them valuable information as well as the tips and tricks they learned on the die-cutting machine during their training sessions. They have been able to put these into practice in their daily work immediately afterwards. This has been our goal right from the start: to transfer content in a practical way so that customers have great benefit for their daily work. The feedback confirms that we were able to achieve this goal in the first months of the Marbach Academy." Marbach Werkzeugbau has invested in two new milling machines to optimize its production. With the type KX30 machines from the Huron company, Marbach will significantly increase its flexibility in producing thermoforming and rotary tools. Lars Schwarzmannseder, Production Manager at Marbach: "We have already been using a Huron machine in rotary cutting-die manufacturing for more than 20 years. A second followed a few years ago. These two machines offer us not only fantastic uptime, but also exceptional long-term accuracy. With Huron, we know what we get. The machine is delivered and installed. And then it runs. And runs. And runs." This is exactly why Marbach has again chosen Huron when selecting its two new machines. One of the new machines will be used in rotary cutting-die production and completes existing plant. The second machine will be used in thermoforming tool manufacturing. Schwarzmannseder continues: "With the two new machines we are increasing our flexibility enormously. Our goal is to cover a large number of manufacturing possibilities with the new Huron machines. This will allow us to relieve our highly specialized production machines during peak periods and to transfer various parts to Huron machines". An improvement in flexibility that will further increase Marbach's delivery performance in the future. Marbach has recently updated its handheld device for placing nicks into cutting rules. So far, this tool – that is known on the market under the name marbanick – could place a nick with a predefined width and depth into the cutting rule. With the new marbanick|2 version, width and depth of the nicks can now be varied in three steps. Nicks play a greater role in producing a packaging blank. Because nicks ensure on the one hand a smooth transport of the board sheet through the die-cutting machine, and on the other hand freedom from waste of the produced blank. For packaging producers, it is vital that the packaging has small and as few nicks as possible, because they distract from the appearance of packaging. There are two kinds of nicks: transport nicks which have an impact on the speed of the producing machine. And waste nicks which are largely responsible for the waste-free characteristics of the produced blank. The new marbanick|2 has not only been equipped with three levels, but also importance has been attached to good handling and achieving the best ergonomic characteristics. So the follow-up model is not only better, but also easier to handle than its predecessor. Marbach offers various solutions to ensure safe embossing of packaging. The Marbach standard already contains suitable solutions for many applications. In addition, Marbach has developed a further option ensuring even more safety in embossing. If packaging is not only die-cut, but also embossed, embossing clichés are then normally positioned on aluminum blocks. This means that the dieboard of the cutting-die contains cut-outs into which aluminum bases for the embossing clichés are inserted. This has the advantage that the embossing clichés have a very even base during the production process. The aluminum substructure can be divided using a so-called Memopin, so that the embossing clichés can be set up quickly and easily from the front of the cutting-die. The tool can remain in the machine for make-ready. Also for die-cutting machines with closed machine frame. A make-ready from the back of the cutting-die is therefore not necessary. Marbach development manager Klaus Rommel: "To ensure that the aluminum blocks are placed securely in the cutting-die and to avoid interruptions in production, Marbach provides two different ways of securing the aluminum blocks. With our standard method, the aluminum blocks are secured in the tool with two grooved pins. This prevents the aluminum blocks with the applied embossing clichés from falling out to the front. This type of protection is adequate in many applications." However, in practice there are cases with particularly high demands or special requirements in which securing to the front is not enough for the operators. Then it is necessary to secure the aluminum block to an even greater extent. Rommel continues: "For this reason, we looked for a solution that would ensure complete protection of the aluminum block against falling out either to the front or back. Our development has resulted in a completely new design of the aluminum block safety. With this version, the grooved pin is no longer required. Instead, a cut-out is milled into the aluminum blocks. The dieboard is given a "nose" at the appropriate point to attach the aluminum block to the dieboard and thus to prevent it from falling out on either sides". This special version of the aluminum block safety device is designed for demanding requirements and offers the operator maximum safety. It can be used in the paperboard sector with multiplex, marbaplex and duramar tools. Marbach produces cutting-dies for the packaging industry. But that's not all. Marbach also offers a wide variety of materials for die-makers and packaging manufacturers. In a new catalog Marbach shows the variety of its products for packaging producers. One product which stands out in Marbach's portfolio is the contour-adapted cutting plate. Head of Marbach Die Supplies, Marco Kraiss: "Many sell cutting plates. We however, do not sell them only as raw material, but also cut them to the contour desired by the customer. Completely individual. Our advantage: we are independent of machine manufacturers. This means that we can supply all sizes for common machine types, regardless of the machine manufacturer." Marbach cutting plates are available in various designs and of varying degrees of hardness. Medium-hard cutting plates, for example, are ideal for use with the Marbach mpower technology. Here the hardness of the cutting plate is optimally matched to the rounded cutting tip of the mpower cutting rule. Unlike many other suppliers, Marbach does not rely on a hardness of 44 or 46 HRC for hard cutting plates, but on particularly hard 48 HRC cutting plates. The extreme hardness of these cutting plates is characterized by very long service life. Marbach signed a joint venture contract at the end of 2017 with Masterwork (MK), a Chinese manufacturer of machines and systems for the packaging industry. After completing all the necessary formalities in spring 2018, preparations for the new Marbach production location in China are currently in full swing. Production at the Tianjin plant is scheduled to start in summer 2018. Dominic Fischer, Assistant Project Manager China: "At the moment we are at the critical stage with intensive collaboration between Masterwork and Marbach. Our joint venture will be located in a large new MK building complex. We will have an area of approx. 1,600 m² available there. Of this area, 1,400 m² alone will be for our new production. The building has been completed and the Marbach area will be designed according to our requirements for a modern and efficient cutting-die production". The production machines and required materials will arrive in Tianjin at the end of June, followed by immediate installation, so that Marbach can start production in summer as scheduled. Fischer continues: "Of course we have expats in China who will be there and support us at the start of production and in the time immediately after. The local employees are already trained in advance in Heilbronn and in our subsidiary in Malaysia. And so we will be able to benefit from our experience of establishing subsidiaries in the USA and Malaysia. In addition, there will be regular visits from the project team to the location, so we will closely monitor the project in China to ensure a smooth start. In addition to the new plant in China, Marbach has many locations around the globe and plans to further expand its international operations in the coming years. For some time now Marbach has been offering pure edge technology for achieving clean visible edges in corrugated board. Many customers are now using pure edge. It has been shown that this technology not only provides clean visible edges for corrugated board packaging, but is able to do much more. Marbach developer Ingo Graham: "pure edge ensures clean visible edges for corrugated board packaging. We have known this for a long time. The success of pure edge and the feedback from our customers confirm this. Since we are enthusiastic about the technology ourselves, we have tested it on other applications. We have discovered that it is very versatile." The material to be cut often pushes the long straight edge knives away during the die-cutting process. The effect: due to the lateral material displacement, the cutting rule tip wears out relatively quickly at these points. This impacts the quality of the die-cutting result. The use of pure edge on both sides protects and stabilizes the cutting rules at the edges. The lifespan of the tool is thus extended and the cutting result significantly improved. In two-sided circumferential die-cutting, on narrow slots or on cutting contours, it is possible that the material which is being die-cut may squeeze the rules apart. This results in unwanted nicks. By using pure edge this can be prevented and the rule joints stabilized. Pure edge can be used as a complete replacement of functional rubbering. Conventional functional rubber absorbs cutting pressure. In order to achieve good die-cutting results, this must be increased. But not with pure edge. Here the material is not unnecessarily tensioned and thus no additional cutting pressure is required. Pure edge should be used above all, in places where increased folding-spring-back forces in the material have to be avoided, but at the same time where no unnecessary traction forces should occur. As with 180-degree package folding, or nearby cut-crease rules for yoghurt crates with little surrounding material. But also on rules with transport nicks. Depending on the requirements, pure edge is possible in widths ranging from 0.5 mm to 3.0 mm. This means that the technology can also be used in narrow places where there is simply no room for profile rubbering. pure edge is made of steel. Compared to rubber, this is very wear-resistant and has an extremely long lifespan. With pure edge, Marbach offers a technology that can be used in a variety of ways and which not only stands for attractive optical corrugated cardboard packaging, but also for long tool life. Marbach is well-known for its customized solutions. Numerous customers rely on Marbach webguides which optimize the production process for inline die-cutting of paperboard. Inline die-cutting (web-fed), is a printing and finishing process which takes place "in one line". The process means, not a paperboard sheet is die-cut, but a roll. The roll material is first fed through the printing machine before it is processed directly in the die-cutter. Inline die-cutting is used, for example, in the production of cigarette, liquid and direct packaging for food products. Marketing manager Tina Dost: "The big advantage of inline die-cutting is speed. However, because the printing and die-cutting processes are directly related, it is of utmost importance that both processes run without interruption. To ensure that the further processing process is stable, the paperboard roll must be optimally positioned in the die-cutting station. If this is not the case, machine standstill can result in cost-intensive production downtimes. This is why our customers rely on Marbach's webguides. With this simple but efficient solution, malfunctions during inline die-cutting can be avoided." Webguides are special elements by which the paperboard web is guided during the die-cutting process. This is necessary because with inline die-cutting, the carton roll is "pushed back" from behind at high speed when it is transferred from the printing unit to the die-cutting station. This may cause airflow under the paperboard material. Webguides are ideally suited to prevent this from happening. They are applied to the steel counter plate and ensure optimal positioning of the paperboard material during die-cutting. Because of the webguides, the paperboard lies flat on the steel counter plate at the beginning of the die-cutting process. This permits safe ongoing processing in the die-cutter which results in a smooth production process. Marbach Automation & Service now offers a cleaning device for corrugated board die-cutting machines: the mplaten|cleaner. With it, the platen of a die-cutting machine can be cleaned efficiently by the machine operator and the machine’s productivity increased. The productivity requirements of the market for die-cutting tools are high. Ever shorter make-ready times are demanded. Important factors in minimizing these times are the technological equipment and the quality of the die-cutting, stripping and blanking tools themselves. For maximum output – in addition to the used tooling technologies and their functionality – the condition of die-cutting machines also play a major role. With this tool, dirt and rust is removed from the platen. Through cleaning unevenness is smoothed out and therefore the work needed for setting-up a tool is reduced significantly. The tonnage can then be reduced thus extending the tool life span. Moreover the die-cutting results are also positively affected through a clean platen. Marbach recommends cleaning the machinery every six months in order to maintain die-cutting machines in the best condition. The masterstrip|plate is not only a powerful tool for high-speed dynamic stripping. It is also the perfect solution for making sure the side flaps in a cigarette box are cut through and opened up 100%. The option of pre-breaking flaps, that can be integrated into the masterstrip|plate, is used in the cigarette packaging area of application. With conventional techniques, automatic pre-breaking of flaps with the male stripper or blanker was often an uncertain process that could lead to interruptions during the production flow. Pre-breaking of flaps has become a safe automated process with the Marbach technology masterstrip|plate. Marbach has recently added a special high-speed tool for flat die-cutting to its portfolio: the marbaspeed cutting-die for corrugated board. This new Marbach tool has been catching on more and more in the market. It is characterized by its being equipped with a new type of rubber: Marbach flexpower. Initially only used for rotary tools, flexpower has been applied to flat tools for the corrugated board industry since earlier this year. With increasing success. More and more customers order their tool in this special version “marbaspeed”. The verifiable high rebound elasticity of the flexpower rubbering ensures very high machine speeds. It is also suitable for large quantities due to its durability. marbaspeed tools are immediately recognizable: due to the white color of the rubbering and also its special structure. Marbach has a new system in place, with which cutting-die and guillotine for corrugated board can be fixed to each other for transport and storage. Guillotines are used in the corrugated board division in order to separate the die-cut blank from the front trim waste of the sheet size. A guillotine is significantly smaller than a cutting-die. It has been common practice to screw the guillotine to the cutting-die, so it doesn’t get lost or damaged during transportation and storage. This previous solution required that several plastic components be fixed with screws to the cutting-die as well as the guillotine. This was not only time-consuming but also ran the risk of losing components. The new Easy-fix S is not only perfectly suitable for the secure transport of cutting-die and guillotine but also for an optimal storage of corrugated board cutting-dies. Tool handling on the machine is very easy with the Easy-fix S. Tool and guillotine can thus be transported securely. Easy to fix they are quickly ready for use. And storage is also safe. The Easy-fix S consists of only one piece and possessing an integrated key function, with which it can be locked in the tool. As a counter pressure for fixation, rubber is used in the area of the balancing rules. So a constant distance between cutting-die and guillotine is guaranteed. The Easy-fix S provides a solution that is characterized by easy handling and secure transport and storage. A die-cutting machine is subject to wear and tear during the production process. That’s why it used to be necessary to fill up worn-out areas with make-ready paper when setting-up every single order. With digital zone levelling this process has become significantly more efficient. Zone make-ready has only to be implemented once and then will last several months. Marbach has expanded its machine park. Marbach has ordered a die-cutting machine from Brausse Europe. The Brausse 1060 ER will be delivered to Marbach in the summer. The Brausse 1060 ER is a die-cutting machine with cutting, stripping and blanking stations. It processes paperboard between 80 to 1,600 g/qm as well as corrugated board up to 4 mm thick. The maximum sheet size is 1,060 x 750 mm. Marbach will not only expand its training division with the new die-cutting machine but also test innovations on-site. This will shorten the time-to-market time-frame. So Marbach innovations will reach the customers much faster. For every requirement the right cutting-die package. Marbach has recently introduced its new modular system to its corrugated-board-processing customers. With this, Marbach customers can quickly compile the appropriate tool package for every order. The Marbach modular system consists of three differently equipped versions: smart, performance and high-end. The smart option is cost optimized. It is suitable for non-repeat orders. When “customers are unwilling to miss out on Marbach quality even with short runs,” says Graham. Tooling packages of the smart version are cost-efficient and have short delivery times. Performance is the output-optimised version which is appropriate for jobs where production performance is the top priority. These tooling packages stand for maximum speed and minimal set-up time. For long-term jobs involving very high quantities, Marbach customers can choose tooling packages from the high-end segment. These are designed for jobs with the highest demands on, as well as the highest requirements of, operational performance and tool life span. Marbach and Brausse Europe, together invite you to the Innovation Days in s’Hertogenbosch. Visitors can look forward to an exciting program with information and live machine demonstrations. According to the theme “reduction of make-ready times” visitors will learn more about efficient state-of-the-art packaging production. During the demonstrations, Marbach will present its latest technologies on different Brausse machines. In die-cutting, Marbach shows its new developments: digital zone levelling as well as mpower|+ and magic sheet. Equipped with these three components, the goal “die-cutting without patching” is getting close. In the area of stripping, Marbach introduces its technology masterstrip|plate. This special male stripper is equipped with a presser plate. This construction ensures a smooth highly safe stripping process with high speeds and waste-free blanks. In blanking, Marbach will show its new technology lightblanker. The visitors will learn in a demonstration, how light and easy to handle a blanking tool can be. And that manual blanking is now a thing of the past. Also the topic packaging refinement must not be missing. “Extraordinary packaging at the point of Sale” is becoming more and more important. On a hotfoil machine, the Marbach technology marbafoil is being presented on a thinplate. In so doing, marbafoil provides beautiful embossing results with the thinplate ensuring highest productivity. Especially for repeat jobs. Marbach Sales Director Bernhard Reisser: “We are looking forward to this event at Brausse. There, we can show the visitors what kind of performance is possible with the right machine and tooling equipment. A varied program together with much practical advice will make the event worthwhile for the visitors. This year, Marbach will exhibit for the first time at the CCE in Munich. The company will present its newest developments there. Marbach will showcase its digital zone levelling technology at the CCE. It is available in different formats. The product levels out height deviations of the cutting platen. Therefore a conventional area patching is no longer necessary. The operator profits from higher machine performance. Together with the mpower|+ cutting-die and the magic sheet, make-ready times can be reduced to an absolute minimum. In rotary die-cutting, Marbach presents its tool marbaspeed|r for corrugated board. This specially equipped cutting-die ensures highspeed in the rotary die-cutting process. With Marbach refinement technologies, all packaging becomes art. Marbach not only offers 2D and 3D embossing, but also hotfoil solution marbafoil. All from one source. Marbafoil becomes especially efficient through the Marbach thinplate system ensuring highest time-savings in repeat jobs. The new embossing laser can provide even finest embossing contours. The pure edge technology allows flawless corrugated board packaging. The new Marbach blanking tools marbablanker and lightblanker. They stand for simple handling. Flexibility. And efficient blanking. The stripping process is very complex. The Marbach tool masterstrip|plate is characterized by smooth stripping with almost no waste. For high requirements to hygiene and product safety, Marbach offers the unique tool marbaclean. This extraordinary hygiene tool is equipped with special safeguards and materials for the food industry. Certified. So customers are always on the safe side. Also with high demands on hygiene. Marketing Manager Tina Dost: “We are looking forward to our first trade fair presentation at the CEE, which takes place between the 21st and 23rd of March 2017 in Munich. And also looking forward to many visitors in Hall B5, booth 1234. Marbach looks forward to an exciting year in 2017. The company has planned comprehensively. Whether international expansion, new technologies or automation, Marbach will invest extensively in 2017 in order to become even better for its customers. Marbach was able to close the year 2016 on a successful note. And also plans for double-digit sales growth in 2017. For Europe as well as worldwide. In order to handle this growth, Marbach will restructure different business areas and increase the number of employees. Besides internationalization, Marbach will invest in the modernization and automation of its production in different subsidiaries. To optimize processes, increase flexibility and reduce cycle times. Marbach customers can soon look forward to even shorter delivery times of their cutting-die orders. In research and development Marbach will further strengthen its capacities as well as the know-how of its employees. Many new Marbach products are already in the trial period. And will ensure best performance for Marbach customers in 2017. An expansion at the Marbach headquarters will be completed at the beginning of 2017. A new floor was added to an existing building. This was necessary because the available premises had become inadequate due to huge growth in the company. This part of the building will now host the following departments: purchasing, accounting and Human Resources. So that these sectors will operate more closely. All under one roof. Also the Marbach die-cutting manufacturing is being modified under the aspect of process optimization. To shorten delivery times and increase the efficiency. CSR is firmly established in the company philosophy. Sustainability is a core value of Marbach. Environmentally friendly products such as the greenplate are being used. Bio plastics are replacing material that contains mineral oils in tools. Renewable energy is being more extensively utilized. Moreover, the CSR report will be revised in 2017 and there will be new investments in energy and environmental measures. Automatic blanking is trending. The advantage is not just productivity. But also an exact delivery of the blanks. For optimal processing. Marbach, worldmarket leader in cutting-die manufacturing, has completely reworked its blanking technologies this year. The results are the two new blanking tools: lightblanker and marbablanker. The lightblanker is characterized by its light weight and cost-efficient design. This tool is perfect for orders that have previously been separated manually. For higher requirements, Marbach has developed the marbablanker. The advantages: it is perfectly tailored to the operator’s requirements and therefore allows a smooth production process. For very small blanks, Marbach has introduced the new special solution nick-breaking. The light way of Blanking. The lightblanker. The marbablanker makes blank separation child’s play. It has been perfectly developed for the customers’ needs. The blanking process is fast and trouble-free. Görtz explains: “Our customers choose from different options. They have an unbelievable variety. And also an unbelievable efficiency.” Blanking has never been this easy, so light, so stable and economical all at the same time. Perfect blanking of small cards. With nick-breaking. Blanking small cards with double knife – such as blister cards and creditcard formats among others – often cause problems. That’s why Marbach has invented nick-breaking. Görtz: “With our nick-breaking tools, the punches in the male blanker are replaced by special pins. These are positioned in a way that the nicks can be separated in a focused and controlled manner. So the ups fall down vertically. Without twisting. Or tilting.” This allows significantly faster machine speeds in special application scenarios with small cards. Without time-consuming machine stops. The blanks can be separated securely. And stacked neatly. Marbach has widened its blanking tool range significantly. And can now offer its customers the perfectly fitting tool for every requirement. For small quantities. And large ones. For simple layouts. And difficult ones. For automatic blanking, that’s worth it. In 2015, we published our first Corporate Social Responsibility report. Creating the report, the company intensively reviewed its activities regarding social, economic and environmental sustainability. In the area of ecology, Marbach already laid the foundation for a successful future a few years ago with its philosophy marbagreen. For the years 2015 and 2016, Marbach is focusing on the topic of environmental protection, especially the subject of saving energy. In 2015, there already have been investments in different plants, which reduce the production hall’s energy use drastically. A central vacuum unit has been installed that is considerably more efficient than conventional systems. Furthermore, a ventilation system and a central chiller unit not only ensure an optimal climate for the employees and the machinery but also an optimized energy balance. Tina Dost: „But that’s not all. At the moment, an energy audit is in progress, in which our consumption is analyzed by an external company. This analysis is used as the basis for recommendations in what areas an energy usage optimization is possible and reasonable.” Throughout the year, Marbach will take appropriate measures for an efficient use of resources. The Marbach Group, global leader in die cutting technology, has been investing more than five million euros over the past two years into a new building and production equipment for the rotary die cutting tools. After expanding and modernizing the machine park in 2015, the project “New rotary production hall Heilbronn” is now completed. A strong revenue growth in this segment is expected for the year 2016. The Marbach Group produces rotary tools for the production of cigarette and liquid packaging since over 20 years. In addition, companies in the automotive industry or medical technology are among Marbach’s rotary customers. This area has been established within Marbach step by step over many years. That’s why not only the space became too restrictive, but also the demands on the floor load reached their limits. Following Marbach’s “Strategey 2023” of expanding the rotary segment, it became necessary to make room for additional machines in order to keep up with the planned revenue growth. The new hall has a usable space of 1,300 square meters. The base plate weighs 2,000 tons and is 80 cm thick. It is carried by 151 concrete piles that reach between 10 and 12 meters into the ground. The Marbach Group is looking forward to an exciting year 2016. Not only the big trade fairs “drupa“, „FachPack“ and „K“ take place this year. Marbach will also present countless novelties. This involves of course mostly product innovations. But that’s not all. Marbach will update its visual appearance and also launch its new website in this context. With the new Marbach nick changing system, you can react fast and easily to varying conditions of your corrugated board material. This means a shorter machine start-up phase. The nick changing system also improves the hygiene in the die cutting environment: grinding additional nicks on press is not necessary any more. This eliminates the grinding dust that could be transferred to the blanks and end up in the customer’s product. The system’s mechanical locking feature enables you to quickly change cutting rules multiple times without any damage to the dieboard. If desired, Marbach‘s pertinax elements marbajump are embedded in the steel counter plate to reduce the sheet’s risk of getting stuck in the creasing channel at weak spots e.g. in conjunction with reverse scoring or embossing. marbajump is highly recommended for inline diecutting. Marbach is pleased to announce that it has recently been strengthened its Board of Directors by appointing Stefanie Greiner as Managing Director. Since joining the company in 1994, Greiner studied business administration and worked as Human Resources Officer for two years before she became Chief Human Resources Officer in 1999. As Chief Operating Officer Greiner has been responsible for the daily operation of the Marbach Group since 2009. Stefanie Greiner joins the board alongside Peter Marbach, Owner & CEO, Bernd Klenk and Hans Masche. Franz Strack (picture), Managing Director of the Karl Marbach GmbH & Co. KG, retired from the business at the end of 2013. Peter Marbach: "Mr. Strack has been working for Marbach for more than half of his life. With his prudence and foresight he has played an important role in turning the Marbach Group into what it is today: the industry leader in diecutting technology." Besides his engagement in Marbach, Mr. Strack runs a very successful family business with his wife: he has 4 children and 6 grandchildren. Bernd Klenk, who has already been part of Marbach's general management since January 1, 2011, has now moved across to replace him as the new managing director. Get Marbach’s all-new offer for Martin rotary diecutters featuring Posilock system: replacing conventional transport shells, we recommend our special, brand-new transport bows. Your main benefits: flexible use, major reduction in make-ready time, and substantial saving in costs and storage space. After four successful days, Taropak in Poznan, Poland closed its doors. Marbach's show highlights, a revised version of the Marbach stripping technology masterstrip-plate and the brand-new lightblanker-s wowed the visitors. Marbach could welcome more than 50 visitors at their booth. Thank you very much for visiting us at the Taropak! Marbach's commitment to ecological sustainability is called marbagreen and the bedrock of our strategic priorities. Over 50,000 sold Marbach greenplates (photo) — the first green dieboard on the market—is the best evidence that sustainability and efficiency can be combined. The greenplate is both earth-friendly and economical. Long-term tests have shown that the greenplate provides low patch up times and high tooling performance. Another green Marbach innovation: We replace our plastic tool components with fully recyclable bioplastic ones. Visit us at our booth D24 in hall 10 at drupa in Düsseldorf May 3-16. Under the slogan "blue & green innovations for your success" we will be demonstrating that Marbach products are both ecologically sustainable and efficient. The Karl Marbach GmbH & Co. KG, the industry’s global leader in diecutting technology, is proud to announce plans for expansion into the Americas. In an official statement, the Marbach Group has presented its strategic orientation for the coming years by investing $3,000,000 in a highly modern production facility in Charlotte, North Carolina. Having focused on substantial growth and investment in Eastern and Western Europe over the past 5 years, the Marbach Group is now focused on providing its customers with a wide range of products and services within the Americas. “Based upon over 10 years of business activities in the Americas and a detailed analysis of the market, we came to the decision of bringing production of our high tech tooling to the local markets”, stated Jan Brunner, Sales Manager. The 14,000 sq. ft. facility will be the first of its kind with full tooling manufacturing capabilities for the largest format corrugated equipment and the most precise folding carton cutting/stamping equipment. “We are excited to offer our customers the ability to purchase all of their high tech cutting, embossing, and foil stamping dies and other related tooling components for folding cartons and corrugated packaging all in one manufacturing facility”, noted Managing Director Bernd Klenk. has extended its management team. Since Novermber 1, 2011, Mr. Bernd Klenk has reinforced the managing staff of the company’s headquarters in Heilbronn, Germany. Joining Marbach in January 2011, Klenk has been Head of International Markets & Associated Companies. Before working for Marbach, the graduate engineer and MBA was responsible for a company in the automotive industry in the U.S. Klenk has long-term international experiences in engineering and the supplying industry. Together with the Owner & CEO Peter Marbach as well as the two CEO’s Franz Strack and Hans Masche, Bernd Klenk will take care of the company’s business. For decades, the Marbach Group has been known as innovative and sophisticated diemaker who is also capable of working out individual solutions for challenging jobs. Now, this image has been confirmed by Marbach customer Friedr. Serong GmbH & Co. KG from Höxter, Germany. Rochus Kramer, Managing Partner of Friedr. Serong: “We are very satisfied with Marbach as our supplier. No other diemaker has greater expertise or is more experienced in finding customized solutions. Not long ago we had a highly challenging Braille job. Marbach took care of our concern and together with Marbach’s extraordinary flexibility and excellent advice we found an individual solution. Since we are using this improvement especially designed for our needs we are benefiting from a considerable increase in productivity of our Braille jobs. In fact, this is not the only reason why Marbach has confirmed us. We have generally made the experience that we are profiting from short patch-up times and high machine speeds when using Marbach tools – everything at a reasonable price. Marbach moulds & automation’s Rügenwalder Teewurst package is awarded “Best Thin Wall Packaging” by IMDA in 2011. The award will be officially handed over on the occasion of IMLCON 2011 & IMDCON 2011 in Phoenix, USA, on November 16-17. But what makes Rügenwalder Teewurst package the best thin wall packaging 2011? Very simple: Together with the packaging manufacturer Weidenhammer Plastic Packaging GmbH, molder of the package, Marbach has taken new directions. “For the first time, an advanced IML enables seamless integration of side and bottom labels without edges in a single step”, the IMDA jury explains its decision. Previously, this cup design was only possible with thermoformed containers and sleeve labels. The IML process developed by Marbach with full-cover-labeling offers greater design freedom with the same “hand-finished” look and feel, the jury continues. In the future, Marbach will pursue its work on innovative products. Together with Weidenhammer and other customers Marbach is working on several projects that will bring significant changes to the packaging industry. First details will be presented by Marbach at the Fakuma 2011, Stand B1-1012. The Marbach-Group, world market leading specialist in diecutting technology, is continuing its policy of expansion by strengthening its global presence step by step. “We have taken the next step towards internationalization“, explains Bernd Klenk, Head of International Markets & Associated at Marbach. After the first contact with the company Cripack, Colombia’s leading diemaker, had been established in April 2010, the partnership was officially sealed on July 14, 2011. But why did Marbach choose Cripack? Bernd Klenk continues: “Since the beginning of this year we are highly interested in expanding our worldwide sales’ presence to perfectly provide our customers with Marbach quality all around the world and to guarantee professional local service. Looking for a strong partner in Colombia we found Cripack.” Last year’s mutual visits, where both companies had the chance to get to know each other, showed that they might match very well. This new generation water-jet cuts several soft materials such as rubber, foam and cork. And, it is the first cutter providing a full-size 40’’ working area to reduce the user’s setup time. marbajet-1000linear’s core is its linear drive unit. Being unique on the market it offers numerous advantages. Besides, the water-jet offers many additional features that are part of the Marbach standard. For example, the cutter is equipped with a high pressure pump operating at 4,150 bar. Ecological sustainability within the field of packaging is getting more and more important. Since more than 1.5 years the German world market leader in diecutting technology, the Marbach Group, has been supplying its customers with the Marbach greenplate—first ecologically sustainable dieboard on the market. But a survey among greenplate users showed that ecological sustainability is not the only reason for the triumph of the Marbach greenplate. Dost continues: “Long-term application has shown that, besides ecological sustainability, the greenplate also provides numerous technical benefits for our customers. This means, we developed something special: an ecologically sustainable material that brings production benefits to our customers. What else could you ask for?” In the meantime, not only the dieboard is ecologically sustainable but also the compulsory edge protectors of the board – plastic so far – are made of biodegradable natural material. At easyfairs Verpackung Schweiz 2011 in Bern the Karl Marbach GmbH & Co. KG will be presenting its recent highlights from March 2nd till March 3rd 2011. First of all, the in-house development and first ecologically sustainable dieboard Marbach greenplate: Since its introduction 1.5 years ago, Marbach has sold more than 19,000 greenplate dies. Even the diemaker itself has been surprised by this success. However, Marbach is not only focused on developing “green” tooling the Marbach philosophy of sustainability – called marbagreen – involves more. For example, the substitution of petrol-based plastic parts by eco-friendly bioplastics is also part of this philosophy. Besides ecological sustainability Marbach will be showing further innovations such as masterstrip-plate, reliable and efficient stripping technology — especially with high proportion of waste in the sheet — and Marbach MDSS, storage system to ideally store cutting tools. been decorated with Braille since 2004. In November 2010, a new European directive, DIN EN 15823, came into force. Until then, the height of Braille characters was not clearly specified. The DIN EN 15823 directive is now setting up minimum heights for Braille embossing for the first time: According to this directive the majority of embossed characters shall be higher than 0.12 mm. The implementation of the directive is very challenging for many conventional systems on the market. But why? Basically, Braille embossing shall meet two contradictory criteria: A light embossing is required to guarantee visually ideal results without bursting cardboard material. However, the embossing shall be as strong as possible so that blind people may easily touch and read the Braille. With this in mind, Braille embossing on packaging is always a balancing act between visuality and readability. Due to the specifications of the new directive a minimum embossing height of 0.12 mm is now required. The cardboard material is heavily stressed and necessarily bursts. The outer cracking is clearly visible which means that the optical appearance of the packaging will be negatively affected. It is a different situation with the Braille embossing system from Marbach. This patented Marbach system has one key advantage: The above-mentioned problem occurs as well when the Braille embossing is higher than a certain level – but, due to the compressed embossing, the cardboard material is immediately “pressed flat”. This means that the embossing does not show any outer cracking visible to the naked eye. As a result, the optical appearance of the packaging is not distracted. The German die making specialist has substantially invested in all of his Eastern European branches. For example, the Polish plants were further expanded — in Tarnowskie Góry a new building was occupied as well as invested in highly modern production technologies, in Kielce the production site was extended. Besides, Marbach Ceska expanded his growth at the new production site in Rajhrad and in Nadlac (Romania) a new building with highly modern production equipment has recently been built. Marbach‘s policy of expansion has also affected Germany. The capacity of the production site in Geyer was expanded step by step so that more than 100 employees are working there now. The acquisition of a new laser system as well as further production equipment is planned for 2011. As from January 2011 the Marbach branch In France (Rouillac) will be taken over by “management buy-out” and realigned by the former Managing Director Emmanuel Béquet. For eight months now, Weidenhammer Plastic Packaging GmbH is manufacturing cups and lids for “Rügenwalder Teewurst” (smoked pork paté) at their production site in Zwenkau near Leipzig (Germany) by using both tooling and in-mould labelling (IML) system from Marbach moulds & automation GmbH. A brand-new insert moulding technique developed by Marbach provides pefectly attractive product decoration as well as some further advantages. Weidenhammer is one of the world‘s leading manufacturer of composite cans, composite drums, luxury tubes and plastic containers. Together with Marbach moulds & automation, tooling and handling system supplier for the injection moulding industry, Weidenhammer Plastic Packaging in Zwenkau has been running numerous projects over the last 4 years. Completely different jobs such as containers for ice-cream, cheese packaging or sausage packs have already been realized. Carrying out the latest “Rügenwalder Teewurst” project both of these innovative companies are treading new paths in in-mould labelling. But why did Weidenhammer choose Marbach from all suppliers? “In this case, it was an easy decision. On the one hand, because we got to know Marbach as an innovative partner for sophisticated projects in the past few years. And on the onther hand, Marbach has a lot of experience of tooling and IML automation providing excellent insertion accuracy. Thus, the perfect partner for a project of this magnitude”, says Operations Manager Maurizio Conte. The Rügenwalder project has started in July 2009. A cup, which has so far been produced with the thermoforming method with sleeve technology (shrinking of decoration), should now be produced with IML technology. A specific challenge was that the existing cup layout was not allowed to be changed. The test results could be applied to the production tools and automation without any changes. Approximately 5 months after the start of the project the production facilities, which had been matched together with the injection moulding machines on Marbach‘s premises, were moved to Zwenkau. Now, the products can be injected, decorated and screened by a camera system in one processing step there. Cup and lid facility are enclosed in a cleanroom to meet Rügenwalder‘s high standard of hygiene. And, all facilities (robotics as well as injection moulding machines) are lubricated with food-safe grease (NSF H1 registered) to leave no room for doubts about hygiene. The high-performance rotary cutting die called marbspeed-r is the latest development of the Heilbronner, Germany, diemaker Karl Marbach GmbH & Co. KG. This innovative tooling technology for corrugated board is mainly characterized by its extremely high performance. The reason for this is that marbaspeed-r is equipped with brand-new, special high-tech rubbering. This means, elastomers are used instead of natural rubber material. These elastomers have the advantage that they are highly resistant and durable. And their production is eco-friendly without propellant. But, of course, rubber material is not all. Also the correct positioning of the rubber in the die is very important for the effectiveness of this brand-new rotary cutting die. This is based on a perfectly developed system of rubber positioning and mounting which leads to optimum results. Due to more than 40 years of experience in producing rotary cutting dies Marbach provides the required know-how. Besides, the new marbaspeed-r is equipped with an in-house developed handle to make the handling easier and secure. The Marbach Group, one of the internationally leading partners of the diecutting and diemaking industry, has recently placed its first marbajet high speed rubber cutting system in Mexico. This well-proven Marbach in-house development is now revolutionizing the Mexican market. While rubber cutting has only been handwork for Mexican diemakers until today, the marbajet is an efficient way to equip die-shops with a certain degree of automation in order to increase productivity. Being the simplest and safest machine on the market to produce ejection rubber at blazing fast speeds, Marbach’s marbajet allows die-makers and converters of all sizes to turn around jobs faster than ever before. So, Lasser Cut, a forward thinking die-maker in Mexico City, was looking for a means to increase their production output in an efficient and simple way. The choice was clear: They purchased a marbajet, the latest technology in high-speed ejection rubber production with a very dynamic power unit (70 m/min). Technology, know-how, service, and parts availability were all important deciding factors for Lasser Cut. As Marbach has half of their marbajet machines installed in North America, parts are stocked at Marbach USA in Elkhart, IN and service personnel are also available from within the USA. The Karl Marbach GmbH & Co. KG will be presenting their latest highlights at Fachpack in Nuremberg from September 28-30th 2010. The first ecological dieboard, the Marbach greenplate, will be celebrating its first anniversary at this year’s Fachpack. Having sold more than 10,000 plates since its launch even Marbach is surprised by the success of this green Marbach innovation. General Sales Manager Silvio Gruber explains: “Of course, we are very happy about the successful launch of the greenplate. Long-term operations have even shown that the greenplate, besides ecological sustainability, also provides some technical advantages for our customers.” What exactly are these advantages he wants to keep secret until Fachpack. “Fachpack visitors will be shown all benefits in hall 7, stand 7-422”, Mr. Gruber indicates with a grin. This year, Marbach will also be informing the visitors what ecological sustainability means to Marbach in details at the special show “Sustainable production and packaging”. But Marbach does not only put their focus on the development of “green” tools but rather continues their philosophy of sustainability – called marbagreen – purposefully and comprehensively. Silvio Gruber continues: “The co-operation with Tecnaro GmbH, winner of the European Inventor Award 2010, is another big step forward for us dealing with ecological sustainability! By launching the masterstrip-plate to the folding carton sector the Karl Marbach GmbH & Co. KG brings a new and highly efficient stripping technology for difficult jobs to the market. With a pressure plate fixed to the stripping upper die the masterstrip-plate provides a stable and reliable stripping process. After Marbach has already successfully utilized the masterstrip-plate in the corrugated board sector for some time this technology is now finally also available for our customers from the folding carton sector.